How many of you have ever seen a scary movie? I don’t recommend them. Being scared is not fun, but sometimes we can’t help being scared. Today we’re going to talk about something scary, but fear not! This devotion has a happy ending. In this segment of Mark, we see Jesus healing another man, but this time, he is casting out demons. This wasn’t an ordinary casting out of demons either. This man that Jesus encountered had an unclean spirit that consisted of thousands of demons (5:9). The man had been so out of his right mind that he was cast out of normal society and forced to live in a cave where people had tried to chain him up, but not even chains could hold this man down. He would scream and cut himself day and night (5:5). This man is clearly not okay. Yet Jesus still let the man seek him out. Notice how Jesus is being approached by a man that can literally break chains, but he doesn’t seem to be worried. That is exactly how we should feel knowing that we have the God of Jesus on our side, too. The demons in this man fear Jesus and respect his authority. It says in verse 13 that Jesus “gave them permission.” They obey Jesus! Now the next part of the story is a little weird, but it is very important. The demons went into a herd of pigs and subsequently flew off a cliff. Okay, maybe they didn’t fly, but it’s still an odd thing for pigs to do. This story is a little different from the story of the blind man that we looked at yesterday. The man who was healed in this story didn’t have a physical impairment; he was healed of a sickness of the mind. These kinds of sicknesses can be even scarier than the kind that affect us physically. One such mental sickness that has become very prominent lately is depression. 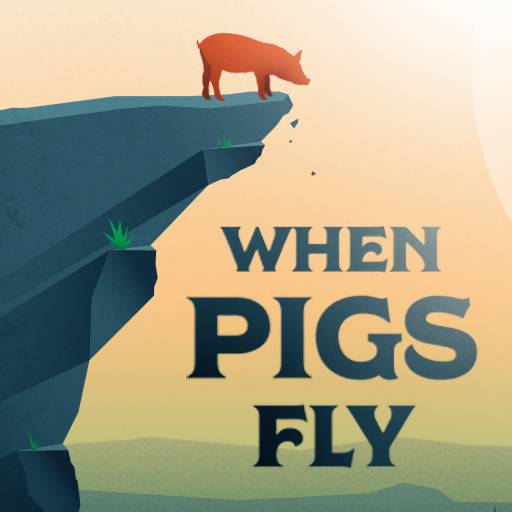 I know firsthand just how many people suffer from depression these days, especially teenagers, so I want to share with you the story of when I saw pigs fly. When I was younger, I had a close friend who suffered from severe depression and harmed herself in ways like the man that Jesus healed. Many times we think that self-harm is unique to our generation but this story really says otherwise. This was a really painful experience for me just by knowing that my friend was going through this. I urged my friend to talk to a trusted adult and to see a doctor because I knew that I was not qualified to counsel on this subject. However, there was one way that I was able to help. I offered my prayers. Prayer became a constant for me in this period of my life. I wanted nothing more than to see my friend freed of this demon, her depression. One day, I wanted to pray with my friend, so we went out to a park and sat together praying for hours. I remember my prayer: “God, I know that you have the power to cast out demons. Cast out this demon.” After repeating this many times, my friend looked up and I could see a difference in her eyes. Pigs flew, and her depression has never bothered her since then. I don’t know whether an actual demon was involved in this story, but depression certainly acts like a demon, taking over your thoughts and actions. Whatever the cause of depression may be, our God is bigger and more powerful and there isn’t anything in this world that disobeys His command. Don’t forget the ending of the story in Mark. After the man was healed, he wanted to follow Jesus, but he was turned down. Jesus told the man to go back to his family and testify to them. This is just like what we saw in John yesterday. After you are healed, Jesus wants you to make sure that the people you know can see that you really were healed. Tomorrow I am going to go into the role that modern medicine plays into the healing that we can receive from God. There is so much information in this chapter that could make good devotions that it’s almost hard to focus just on the healing! In this chapter, we get to follow the story of a man born without sight. It goes like this: the man is blind, Jesus restores his sight, the man testifies about the healing he received, the man is cast out by the Pharisees and the man is accepted by Jesus. First, the man is blind. It might be easier to focus on the spiritual blindness that Jesus talks about in verse 41, but I really want to focus on the physical blindness of this man. The most important thing to note in this passage is that Jesus says “neither this man nor his parents sinned” (9:3). Jesus doesn’t mean that the man has never sinned, but he does mean that the man did nothing to deserve his blindness. I firmly believe that this applies to us as well. Whenever we get sick, whenever we know someone who gets cancer or becomes paralyzed, this is not a punishment from God. We didn’t do anything to earn our ailments. That is just the world that we live in; people get sick. But in the same way that sin exists so that God can show us grace (Romans 5:21), sickness is an opportunity for God to show his power. Yet that still doesn’t make sickness a good thing (Romans 6). In fact, sickness is terrible. Once we have accepted that sickness is not our fault, we need to seek healing. This can mean many things, but I want to start by telling a story. A pastor that I know has been visiting hospitals and praying for the sick for many years. On one visit, he was with a woman who had lost her sight as a side effect of another sickness. He prayed with her and asked that God restore her sight. She remained blind. He prayed for her again yet she remained blind. The woman asked him to pray one more time. He did. She still couldn’t see. As he left, and he didn’t learn this until a time later, the woman saw his back as he walked out of the doorway. God had restored her eyesight. I tell you this because I see a command in John 6. After the man is healed, he tells everyone that he knows how he was healed by Jesus. In the same way, I think we have a responsibility to share about the healing that God brings about in our own lives. How can God’s works be displayed (6:3) if we don’t talk about them with everyone we meet? Don’t forget that after the man testifies, he is rejected by some of the religious community. It can be hard to believe someone when they claim a miracle has happened, especially when we don’t experience it ourselves. I think we could all use a little more faith in our lives sometimes. Don’t let blindness come in between you and the great works of God. The fact that the man is accepted by Jesus afterwards just points a good ending to the story. The man had already received the sight that he had been missing his whole life; it would be such a shame if he lost his faith immediately afterward because of the disbelief of the religious community. Prayer is powerful even today. Tell everyone of the healing that you experience. Have faith in your God’s works. Know that Jesus is there to accept you when you are turned away because of your faith. Happy Monday everyone! Today, you are getting two awesome posts from Lacey Dunn! The memory verse for this week is Romans 3:23-24.